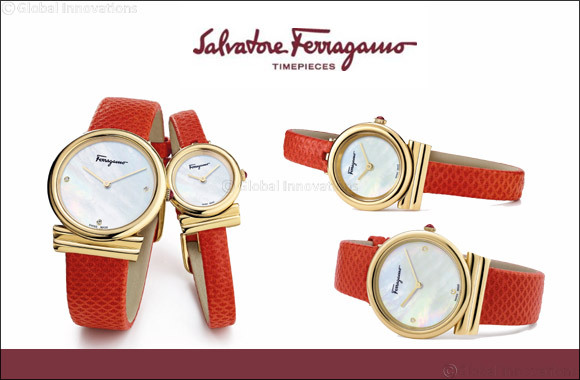 Dubai, UAE, March 14, 2019: Gancini, the most iconic symbol from Salvatore Ferragamo, has evolved in the timepieces collection with a more contemporary twist, ever more exquisite and transforming the line into a must have of 2019. The case – available in two lady’s sizes: 22 and 34mm in diameter – is now slimmer, sleeker and more graceful. The case back is embellished with an engraving of Palazzo Spini Feroni, the historic headquarters of the house, in Florence. The mother-of-pearl dial gives the watch a chic, feminine feel, while the burgundy cabochon crystal, set into the crown, lends it a touch of glamour. In the larger version, the Gancini has three diamond indexes to make it even more stylish. The karung leather bracelet comes in a range of vivid colours – flame red, caribbean blue and periwinkle – making it the perfect match for the palette of the Salvatore Ferragamo Spring/Summer 2019 runway show. The new Gancini will be available from April at Salvatore Ferragamo boutiques, authorised retailers and online.